There is no "perfect number..."
... and there's no exact answer to this question. The chips you'll need will vary, based on what game you are playing, how many people you are hosting, and your stakes and minimum bets. Oddly, you'll find if you try to follow all these suggestions at once, the numbers will never work out quite right. But there are some general guidelines on how many chips you should have on the table when the first hand is dealt. What game will you be playing? How many players will be playing? How much will players be comfortable betting? The minimum bet will be the lowest bet a player can place in the early rounds of play. Many card rooms require you to buy in for between 40 and 100 times the minimum bet, to allow each player to play in lots of hands. 2. Have some extra chips if you will be allowing re-buys, chips your players can buy after they "bust," or lose all their chips. Remember, not all your players will need re-buy chips. Someone has to be winning. A re-buy can be for any set amount, and could be for a new start, an amount equal to the original starting amount. You could use high-value chips for re-buys, allowing players to make change with other players and saving you the cost of more chips. How many of each denomination? Depending on the amounts your players will be betting, the four-three-two-one rule could make your high-value chips too high for your players, or drive up the buy-in. Instead, you could easily use a "four-two-one" rule," or another ratio that suits your game. If you issue too few chips to your players at the start of the game, you may change the way players bet. If a player starts with a smaller number of higher value chips, they may fold more often, risking a chip only when they have a good hand. Other players will quickly pick up on this, and the dynamics of your game will be changed. Using non-denominated chips? Post a sign. If your chips are not denominated, you should have a clear sign -- and maybe two signs -- indicating the value of each color chip, so there's no confusion about their value. This will keep players from betting more than they intended. In tournaments, increasing the "blinds" and minimum bets over time means as play progresses, players need to place increasingly higher bets to stay in the game, increasing the value of the pot and forcing players to risk more. It drives your group toward determining a winner. Increasing blinds are common, but are not required in your game. Many friendly cash games don't require increasing ante or blinds. When your minimum bets or blinds increase past the value of your lowest-value chip, you can clear the table of those low-value chips. If a player has lots of low-value chips, change them for a chip valued at the new minimum bet. Most events have a scheduled starting time. Adding breaks at specific times can be useful. Generally, the hand on the table at "break time" is finished, and then there is a defined break (15 minutes, etc.). This will allow your players to get something to eat away from the table, avoiding the inevitable spilling of food on your beautiful card table. Chips and cards should stay on the table during play and during breaks. Record what each player received as a "starting stack" at the beginning of play, and the total number of chips you began with for your event. Do a "chip count" following your event, and ask trusted players to assist in the count. How and when your event will end should be decided and announced to all the players before starting. If you plan to play until someone wins all the chips, everyone involved should be aware that they could be playing for a long time. If you have a specific ending time, you should announce it ahead of time. Generally, the hand on the table at your ending time is finished, and no more hands are dealt. Also, ask at the start of your event if any players need to leave before the end of the event, eliminating any bad feelings if a player happens to be winning when he or she leaves early. Play for points -- It's simple. Just give everyone the same number and value of chip "starting stacks." Play until everyone but the top player is out of chips. You can play for bragging rights only, or award a prize to the top player. You can also modify this plan to award prizes to the top two or top three players in your group. Or announce a specific "ending time" to your game and the winners will be the players with the most points at that time. Play cash games -- Simply determine what stakes your players are comfortable with -- the total they'd risk in the game all night. Most people are comfortable in games where the stakes are equal to a typical evening out in your area. Players can play for cash using casino chips -- denominated with their real values or non-denominated with cash values assigned to them. Always make sure your cash game is legal where you are playing. Our "240-chip Low-Limit Cash Game" chart is designed for a small group of up to five to play for up to $50 each in cash. This is how most people played poker before the popularity of Texas Hold 'em and houses big enough for 10-seat poker tables. It requires a small set of 240 chips using the 4-3-2 denomination ratio. Your game should last up to about three hours or until a designated "last hand" time, and there will be some of each chip leftover for re-buys. You can buy a set of Key West chips like this here. 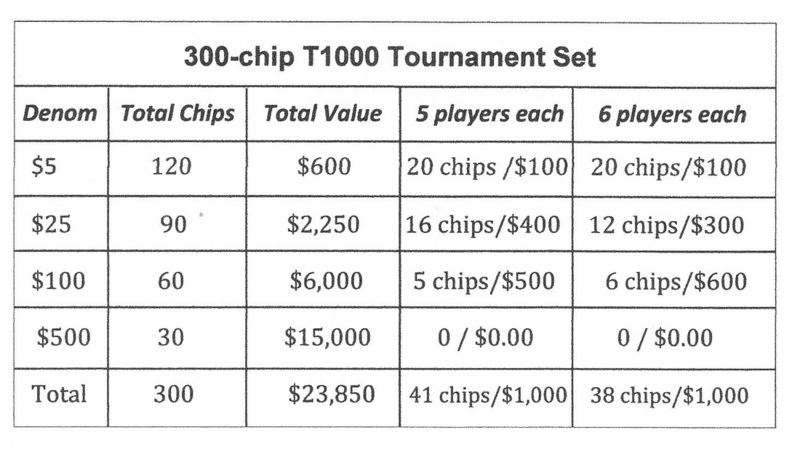 You can seat up to six players with a 300-chip T1000 Tournament Set using the following chart. It's perfect for a poker night or small tournament at home, with up to six players starting with 1,000 points ($1,000 in chips). You can buy a set of Key West chips like this here. Our "Perfect" 500-chip set is the number and breakdown most recommended for home games by the experts for longer tournaments. You get 500 chips in the 4-3-2-1 ratio, perfect for seating up to 10 players for a full evening of tournament-style play. Each player starts play with 2,000 points ($2,000 in chips). You can buy a set of Key West chips like this here. Permissions: You have permission to copy and use any of these charts for your own use in legal home poker games or at licensed charity or card room games or events, or when your game is played for points only among friends and family. No permission is granted to copy or use these charts to engage in any activity prohibited by your local laws. The Key West Resort & Casino is not a real casino, and does not operate any gaming operation, on the web or elsewhere. It's a line of fine casino-grade game supplies made by casino industry manufacturers for Continental Card & Game Co., Wilmington, Delaware. The Key West Resort & Casino logo is a trademark of Continental Card & Game Co., and material on this site is protected by U.S. and international copyright laws. The Continental Card & Game Co. complies with the requirements of 15 USC § 1173. Click to visit Key West's Responsible Gaming page.